The ORVKIT1 is a package that includes everything you need to take your UTV, sand rail, or whatever to the next level in sound. 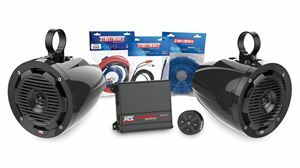 This kit includes the all new MTX MUD100.2 which is the most compact amplifier that MTX has ever made. The unit includes 2 channels that are capable of delivering 100 watts of RMS power per channel, perfect power for driving the included marine tower speakers, one per channel. 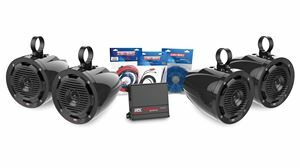 The two MUD65P MTX roll cage speakers can project amazing sound so you can enjoy your music as your cruising the dunes, trails, or wherever. Wire, fuse, fuse holder and fittings required to connect amplifier to electrical system. The ORVKIT1 is a package that includes everything you need to take your UTV, sand rail, Jeep, or whatever to the next level in sound. This kit includes the all new MTX MUD100.2 which is the most compact amplifier that MTX has ever made. This unit features full range class D topology that delivers exceptional sound quality and excellent thermal efficiency. 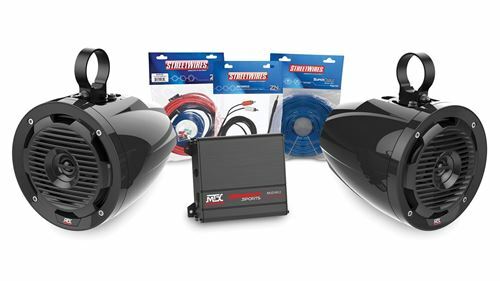 The unit includes 2 channels that are capable of delivering 100 watts of RMS power per channel, perfect power for driving the included marine tower speakers, one per channel. 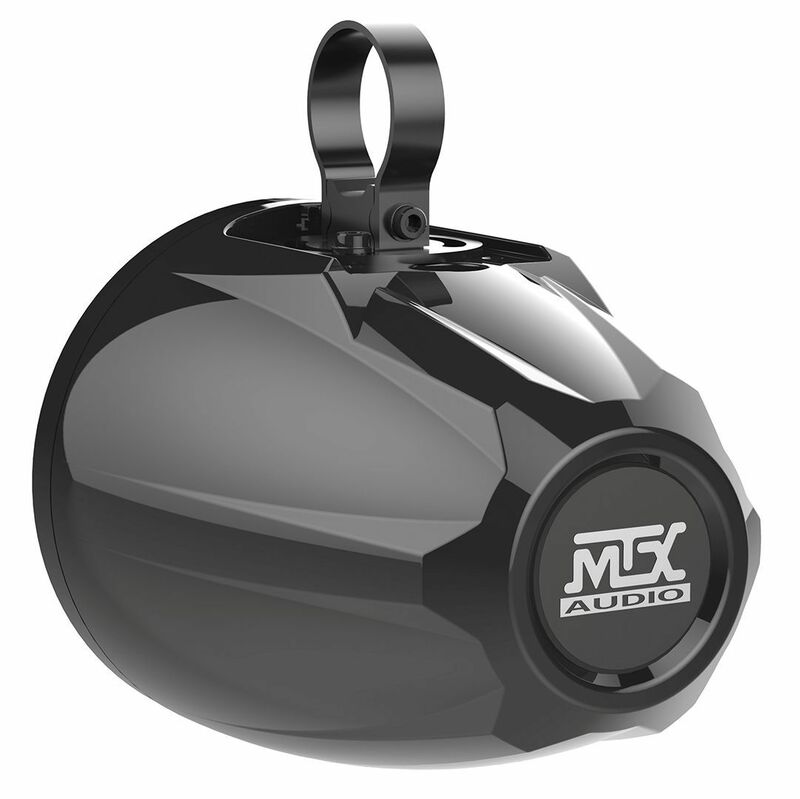 The two MUD65P MTX roll cage speakers can project amazing sound to get you rocking big time. Crank them up in your UTV and enjoy the ride. Both of these units are weather resistant. The MUD100.2 includes a conformal coated circuit board and control covers that prevent damage from moisture intrusion. The unique design includes a pigtail that contains all of the wiring necessary to connect power, ground, and signal without having to make a connection directly at the amplifier. This pigtail keeps moisture, dirt, and other hazards from harming the internal components of the unit. The speakers feature weather resistant polyproylene cones, a Teteron tweeter, and a rubber surround, all of which are water resistant. The grille is made out of impact and UV resistant plastic and the enclosure is rotationally molded out of polyethylene. The included 10-gauge amplifer kit includes power, ground, and remote turn on wire as well as a fuse, and fuse holder. Additionally, the package includes interconnects to connect your source to the amplifier. This package is built to withstand anything that mother nature can throw at it and to ensure you can enjoy your music wherever life takes you. 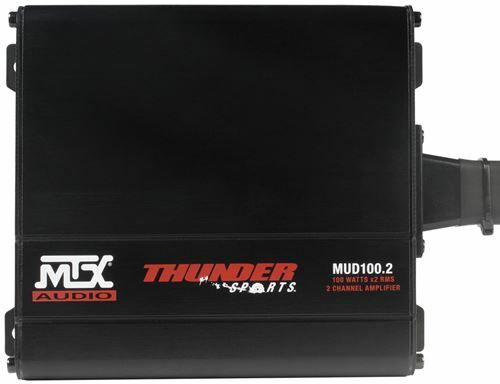 The MUD100.2 is the ideal compact, yet powerful, amp for outdoor UTV, marine and bike audio applications. Click here to see how the MUD100.2 stacks up against the "other guys"
The MTX MUD100.2 is the most compact amplifier that MTX has ever made. This unit features full range class D topology that delivers exceptional sound quality and excellent thermal efficiency. The unit includes 2 channels that are capable of delivering 100 watts of RMS power per channel. More than enough power to drive a single or dual full range speakers per channel. The entire amplifier is weather resistant including a conformal coated circuit board and control covers that prevent damage from moisture intrusion. 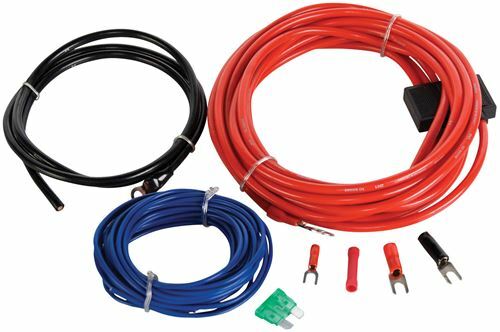 The unique design includes a pigtail that contains all of the wiring necessary to connect power, ground, and signal without having to make a connection directly at the amplifier. This pigtail keeps moisture, dirt, and other hazards from harming the internal components of the unit, ensuring you can enjoy your music wherever the trail takes you. Unlike other marine product that is just a white version of car stuff, Thunder Marine is designed for the harshest marine environment. 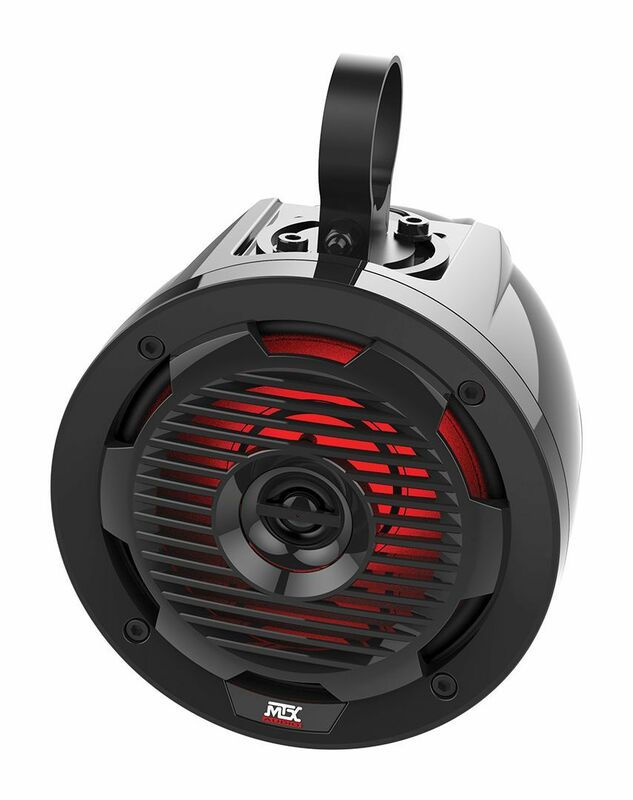 The MUD65P is a 6.5" coaxial speaker capable of delivering up to 50 watts RMS power and designed to mount to roll cage of UTV's. These speakers are designed to withstand the elements. They polypropylene woofer and dome tweeter are weather resistant. The enclosure is highly durable and includes a UV inhibitor that will prevent it from fading over time. The grilles feature ABS construction making them nearly unbreakable and all connections are made through the mounting bar and mounting bracket so no speaker leads are exposed and will not be corroded. Fits Bars Between 1-1/2" and 2"
This package works with Polaris, Can-Am, Yamaha, Kawasaki, Honda, Massimo, Kymco, Kubota, John Deere, and other vehicles with roll cages between 1.5" and 2" roll cages.